Loved, hated, revered, but always talked about. BrewDog have always been incredibly divisive, but their influence on the UK's modern, independent beer scene cannot be overstated. When James Watt and Martin Dickie started the brewery in 2007, the latter having gained strong brewing experience with Thornbridge, the beer landscape in this country looked very different. By applying ideas from US craft beer, alongside an uncompromising approach to branding, they helped to disrupt the status quo and establish new demand for unconventional, flavour-packed beers. Since then, BrewDog have grown rapidly and flagship beers like Punk IPA have acted as gateways for a whole new generation of drinkers, whose eyes have been opened to the huge number of exciting and innovative breweries currently operating in this country. 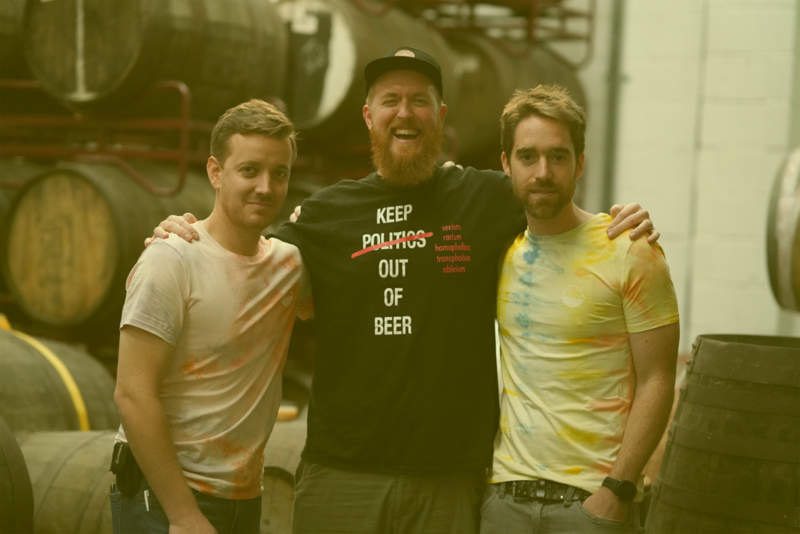 BrewDog have also used their influence to open new opportunities for independent brewers, playing a leading role in helping this niche market to continue growing. Recently, they opened a second brewery in Columbus, Ohio, as well as Overworks, a dedicated wild and sour ale facility led by the talented mind behind Wicked Weed's previous success, Richard Kilcullen. We've worked with Brewdog on two collaborations to date, New England IPA and New England IPA v2, both brewed in 2017. We've also been invited to pour at their AGM on several occasions, sharing our beer with their Equity for Punks shareholders. Burning Sky is the realisation of a dream for founder Mark Tranter. 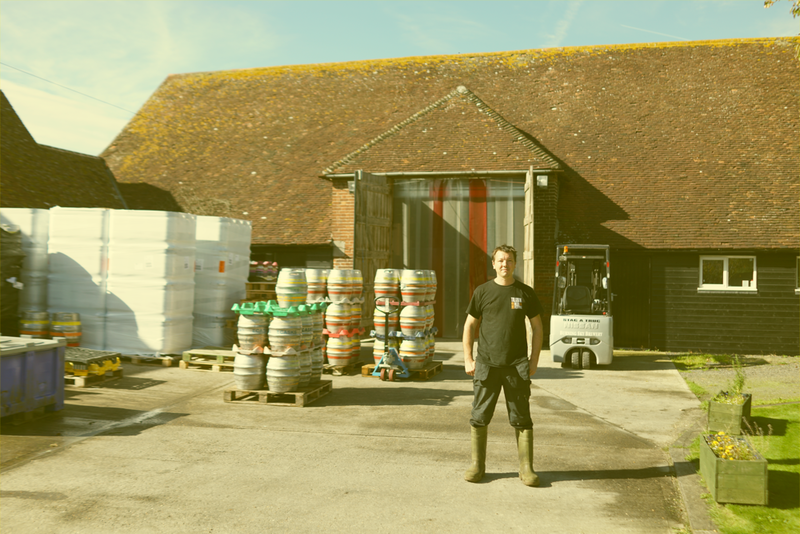 After 17 years at highly-lauded Sussex cask ale brewery Dark Star, including 12 as Head Brewer, it was the chance to make the beers he had always wanted to. Built in refurbished farm buildings in the beautiful South Downs, Burning Sky started brewing in 2013 with a dual focus on punchy, hop-forward pales and traditional Belgian farmhouse styles. They very swiftly found their feet and have since become the first craft brewery in the UK to install oak foudres for ageing beers in, as well as constructing a bespoke coolship in a restored, Grade 2-listed barn for the production of spontaneously-fermented beers using microflora from the Sussex countryside. All of this has led them to become one of the most highly-respected producers of mixed-fermetation and wild beers outside of Belgium. We have worked with Burning Sky on a beer back in 2015, a Biere de Garde called Old Garde, and more recently at the end of 2017 on a spontaneous beer brewed and currently maturing in barrels at their picturesque brewery in rural Sussex. Theo and the team at Deya Brewing Company are intent on creating fresh, intense, delicious beers. with a predominant focus on soft, hoppy pales. Since starting out in early 2016, they've enjoyed a remarkable rise to prominence, with drinkers across the UK recognising the skill, care and keen attention to detail exhibited by their beers. Freshness, and clarity of flavour and aroma are the key parameters Deya consider when designing beers, and these qualities shine through in such standards as Steady Rolling Man and Into The Haze. Deya were part of our Awkward Phase collaborative brew along with Verdant and Northern Monk in 2017. Duration is the vision of husband and wife team, Bates and Miranda, to create a true farmouse brewery in West Norfolk by transforming a derelict 16th-century barn on Abbey Farm, a site deemed a scheduled monument by English Heritage. Their ambition is to deliver fresh, wild and blended farm-style beers with a sense of belonging by making full use of the fantastic natural environment of the Nar Valley and all its rich produce. The brewery, which will be nestled midway along the Nar Valley Pilgrim Trail by the banks of a chalk river, is not expected to open its doors until late 2019 but Duration recently brewed their first beers at Amundsen Bryggeri in Norway. We collaborated with Duration on Fool For You in 2017. Since 2009, The Kernel have quietly been creating some of the most flavoursome, multi-layered and skillfully-made beer to come out of the UK. No hype, no hyperbole, just a constant stream of forward-thinking beers with a strong sense of place. Founder Evin O'Riordain was working as a cheesemonger for Neal's Yard Dairy in Covent Garden when plans for The Kernel were hatched. During a stint working in New York that opened his eyes to the rapidly-growing beer community in the US, he resolved to open his own brewery and realised that ambition after honing his approach through a spell of home brewing. Since then, they have forged a strong path where modern ideas and historical inspiration meet, at first through the production of both bold, hop-focused pales alongside classic London porters and stouts, and now also through a series of wild and mixed-fermentation beers. The Kernel's influence, both in London and across the UK, cannot be understated. They have acted as the inspiration for many breweries to start up, helped to shape drinkers' perceptions of modern British beer, and also played an active role in delivering experience, training and advice to a number of brewers working within this country's beer scene. The UK's undoubted lager maestros are working hard to redefine what this group of classic styles mean to the country's drinkers. Partners Alex Troncoso and Annie Clements started the brewery in Bristol midway through 2016 with a focused core range of five beers, including two lagers, a traditional farmhouse ale, a red ale and a tripel. But easily the most recognisable of these beers is Keller Pils, which has emerged as their flagship beer and is helping to change drinkers' perceptions towards lager in a market that was previously sceptical. Alex's brewing background includes a long stint at Little Creatures in Australia and time with Camden Town Brewery, but Annie can more than hold her own, having once beaten Alex in a homebrew competition! Lost and Grounded excel in producing beers that are clean, true to style and full of nuance and subtlety. There's an undeniable elegance to everything they produce and their focus on lager makes them an important brewery as the growing independent beer scene in the UK targets continued growth. We've brewed two beers with Lost and Grounded down in Bristol, Another Lost Tuesday and Summer 18 No 1, and they joined us in Manchester for Loral And Ardi alongside Verdant. Local pride intertwined with a global view provided the foundation for Magic Rock. Born out of a strong, traditional ale scene in West Yorkshire, yet simultaneously influenced by the bold, innovative approach of US craft beer, the brewery was started by Richard Burhouse in 2011 using an old out-building of the family business - an importer of crystals and natural gifts in case you were wondering, hence the name! Working with Head Brewer Stuart Ross, Richard quickly succeeded in making Magic Rock one of the most distinctive and inspirational breweries in this country, yet still one of the most approachable, and they have played a crucial role in converting a large number of drinkers to British independent beer. Core beers like High Wire and Cannonball played a key role in establishing new ideas about what 'pale and hoppy' could mean, while others, such as Rapture and Ringmaster, act as shining examples for the beauty of balanced cask beer. These beers are produced with enviable consistency as part of a large and varied core range and it is that refusal to let standards drop, coupled with a willingness to continually adopt new ideas, which ensures Magic Rock continue to be seen as one of the UK's leading lights. The success of Seshfest, their celebration of low-ABV beers, also acts as a major inspiration as we plan our own festival, showing how a strong concept and convivial atmosphere create a top-class experience. We hosted Magic Rock to create the much-loved Three's Company in 2016 before making the return trip to brew Big Dipper later the same year. The Northern stars of Northern Monk Brew Co are a force for creativity and progress in the British industry. Evoking the monastic brewing tradition of their Yorkshire home, they aim to combine the best of traditional monastic brewing values with a progressive approach to ingredients and techniques. Founder Russell Bisset and Head Brewer Brain Dickson quickly pushed the brewery to the forefront of the UK scene by creating beers that capture their northern roots, while showcasing big flavours and forward-thinking techniques. Northern Monk also aim to support and showcase like-minded brands and creatives who share their vision of craftsmanship and quality, primarily through the Patrons Project, which has continually pushed creative boundaries. Northern Monk also host the incredible Hop City and Dark City festivals at their Refectory in Leeds, which have both acted as inspirations when planning our own bash. So far, we've brewed three beers with Northern Monk - Awkward Phase in 2017, along with Deya and Verdant, Hop City in the same year and Don't Mess With Manchester, which marked the opening of their Manchester Refectory. Siren are firmly established as one of the leading lights in the UK's growing independent beer scene, having achieved a fine balance between accessibility and adventure. Darron Anley left the comfort of a career in IT to set up the brewery in 2013 with an underlying philosophy to always make the beer they want to make. They have stayed true to that guiding principle since, whether through their core range - which are designed to be approachable enough for the unitiated without compromising on flavour - or their myriad special releases. Siren's experimental bent is demonstrated through their stewardship of the Rainbow Project and the more recent Project Barista that has seen them seriously push the boundaries on the different ways coffee can be used in beer. 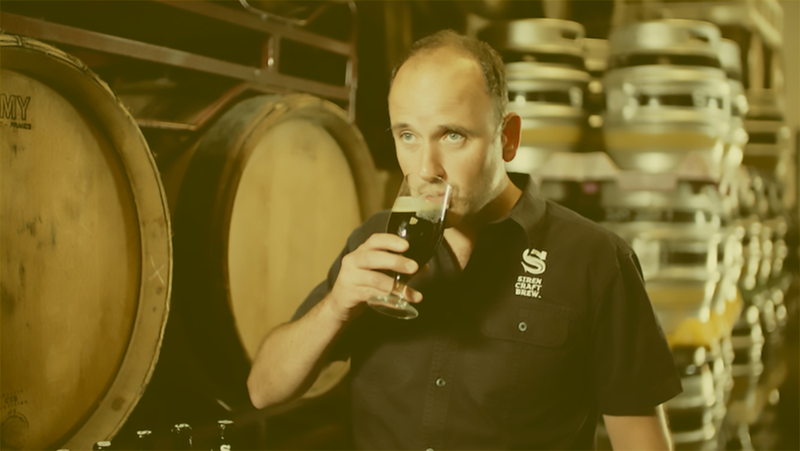 Siren also have exciting plans for expansion in the years to come, after smashing their target in a recent crowdfunding campaign, which will see them up production capacity and open up taprooms in new locations across the country. Siren also have exciting plans for expansion in the years to come, after smashing their target in a recent crowdfunding campaign, which will see them up production capacity and acquire a top-of-the-range canning line. We've collaborated with them on one beer so far, a barrel-aged sour that is due to be released in the near future. Six°North were born in Belgium when founder Robert Lindsay fell in love with the country's beer culture. On returning to Scotland, he set up his own brewery in 2013, crafting Belgian-inspired beers in Laurencekirk near Aberdeen, six degrees north of Brussels. They maintain four different threads in their beer: a core range featuring six classic styles with a Belgian accent; a hop-forward range that showcases a love of modern beer and New World hops; a series that reflects changes in seasonal drinking habits and ingredients; and collaborations that allow experimentation with unusual and special ingredients. We headed across the border to brew a collaboration with Six°North back in 2016, which saw our differing approaches come together for a Motueka Tripel. Mancunians need no introduction to our friends and near neighbours Track Brewing Co, specialists in the pale and hoppy who have finally started to get the widespread recognition their consistently excellent beers deserve. Taking inspiration from founder Sam Dyson's travels round the world on a pedal bike, a sense of adventure runs through everything Track do and they have become one of the leading lights in our hometown beer scene. Big flavours are accompanied by balance in all of their beers and their pale numbers have a characteristic soft and rounded hop character that keeps you coming back for more. But there is still a lot more to come from Track and their range is set to continue evolving as they explore new styles and flavours through their talented brew team. We collaborated with them on three different beers in the summer of 2018, including one for Manchester Beer Week, and they've had plenty of other collaborations with other breweries both near and far. Hop deviants Verdant Brewing Co. have been hazing a trail from Falmouth in Cornwall since 2014, and have been creating fruity, crushable brews at their current site since 2016. Adam and James started out as homebrewers desperate to get better access to more hop-forward beers, than they could get in any of their locals, but plans accelerated after they took a clone of Russian River's Pliny The Elder to Small Bar in Bristol and, after a few drinks, bullied the staff into trying the beer in front of them. They were so pleasantly surprised that they promised to buy Adam and James' beer if they ever went pro. It became clear what the duo had to do and they set up Verdant to brew things their way, creating the beers they enjoy drinking. Since then, they have experienced a meteoric rise in popularity, becoming one of this country's undoubted forerunners in the creation of hazy, juicy pales and IPAs. We have collaborated with them on three beers thus far: Awkward Phase in 2017 with Northern Monk and Deya, Swifts or Swallows? and New West in 2018. Wylam Brewery was founded in 2000, and has grown and developed into a destination brewery in Newcastle’s Exhibition Park within the the Palace of Arts, the sole remaining building from the 1929 North East Exhibition and undoubtedly one of the most breathtaking brewery spaces in the world. 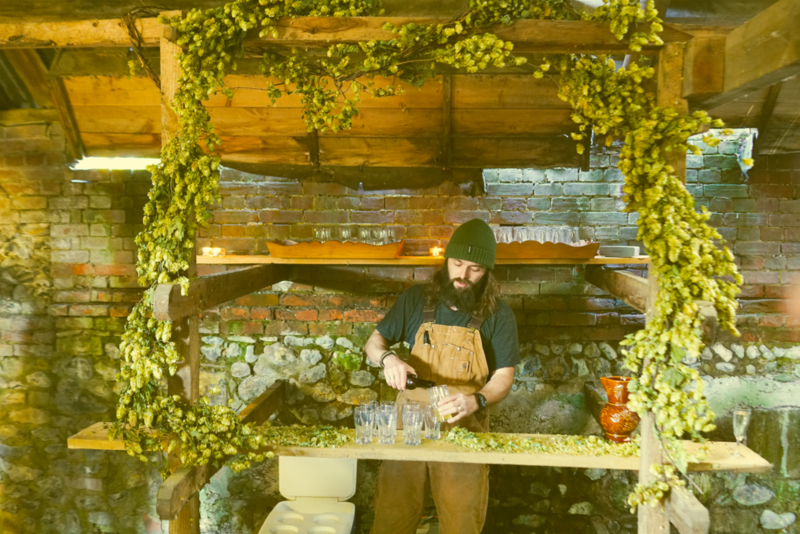 This stunning venue hosts Craft Beer Calling, a festival we have enjoyed several times both as attendees and as a guest brewery, and which is renowned for its Northern hospitality and Kate Bush dance-offs. Under the leadership of Dave Stone and Head Brewer Ben Wilkinson Wylam have come a very long way from their roots as a cask-focused brewery born out of a potting shed in the village of Wylam, Northumberland, which largely served a risk-averse local market. In only a few years, they have broken free of the previous constraints and now produce some of the most well-thought-of juicy pales and IPAs in the UK, as part of a daring and experimental range, but with a traditional core that will never die. We’ve collaborated on two beers in the past with them: World Collide in 2016 and the Strong Brown Ale for the Northern Powerhouse Series in 2018.